How innovative is Mexico compared to other countries? Innovation is an important ingredient of economic growth, especially growth in the decades ahead. While most people know what innovation is, it is not an easy concept to measure. Fortunately three different groups have attempted to measure it and compare countries on their “innovativeness”. All three rely on such measures as research and development, number of patents, number of researchers per person, manufacturing, and the percentage of college graduates with science and engineering degrees. However, the number and character of the specific individual variables they use are quite different. As a result their international rankings can be very different. The three approaches are briefly discussed below. Bloomberg’s “Global Innovation Quotient”, for 96 countries, ranked Mexico ranked in 2012 as 46th, just behind Chile (41st) and Argentina (43rd), but ahead of Brazil (57th) and Venezuela (62nd). Other notable countries ranked as follows: Finland (1st), Singapore (2nd), USA (7th), Switzerland (8th), Canada (19th), Russia (22nd), Israel (29th) and China (32nd) and Indonesia (64th). 2. In 2009, a “Global Innovation Index” was produced by The Boston Consulting Group (BCG), the National Association of Manufacturers (NAM), and The Manufacturing Institute (MI). 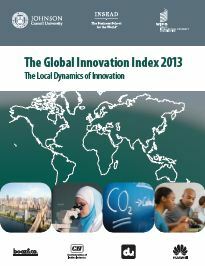 In March 2009, the Global Innovation Index ranked Mexico 57th. For comparison, it had Chile at 37th, Argentina at 92nd, Brazil at 72nd, and Venezuela at 108th. These rankings are significantly higher than the Bloomberg rankings above because this index included more countries which pushed the Latin American countries lower down on the ranking list. But there are other important differences in how innovativeness was measured in the two studies. Compare the following rankings with the ones in paragraph above: Finland (7th), Singapore (1st), Switzerland (3rd), USA (8th), Canada (14th), Russia (49th), (Israel 16th), China (27th) and Indonesia (71st). 3. The third index, confusingly also called the “Global Innovation Index”, is published jointly by Cornell University, INSEAD (The Business School of the World) and the World Intellectual Property Organization (WIPO). This very complicated index is based on six pillars (Institutions, human and capital research, infrastructure, market sophistication, business sophistication, knowledge and technological outputs and creative outputs. ), each with sub-pillars, and a total of 84 indicators. Of the 134 countries analyzed in 2012, Mexico ranked 79th, way behind Chile (39th) also lagging behind Brazil (58th) and Argentina (70th), but way ahead of Venezuela (118th). This complex index’s rankings are different from but generally align with the two other indices: Finland (4th), Singapore (3rd), USA (10th), Switzerland (1st), Canada (12th), Russia (51st), Israel (17th) China (34th) and Indonesia (100th). These three indices appear to tell us that Mexico is relatively weak when it comes to innovativeness. Mexico, along with Brazil and India, appears to lag behind other major emerging economies such as China, Russia, South Africa and Thailand. This is a bit surprising considering that Mexico is a world leader in the export of smart phones, flat panel TVs, automobiles and appliances. Apparently these exports are manufactured in Mexico but the innovations that go into their designs mostly come from elsewhere. Though Mexico is graduating thousands of engineers and science majors, these are either not yet innovating or are finding employment in other countries. If Mexico is to compete in future world trade, it would do well to take steps now to improve its innovativeness. There are more things that keep Mexico not just behind, but definitely going backwards with the kind of corrupted Government officials, starting with the Presidents’, that it doesn’t deserve to keep its Country as poor as it can gets just in order to have it hunger to receive a bean and chili taco and a Coke or a miserable pay any time there is an Election day in order to go to the polls on the back of a cattle rack truck the Party provides to vote for their corrupted Political Party that give them the Taco, not the hope and opportunity of improve their lives, and yes, there are thousands of new Professionals’ going into the streets to beg for a job to survive, since there is NO real opportunity for jobs, and when the established Industry asks’ for an specific professional to fill a job, they all ways ask for people with at least 3 to 5 years of experience, and of course, the only thing they do, is taking it from another Company by offering a better wage or a way to prosper, etc., and the new Professional the only thing he or she can do, is migrate if he has it’s parents support, or apply and gain a job or opportunity to Master abroad, or to work in a poor job well behind his studies or dreams, open a taco stand or become a street or house to house vendor, or definitely, spoils himself on the underworld of drugs and crime… this is the real Mexico, that of course is dynamic and improving in some regions, mainly in about a dozen of well known Cities, and that’s all, but since there are millions in other States, they keep migrating to this Cities and making them big problems, since Mexicans are free to go everywhere they want, and of course, some thousands of this try hard to survive by risking their lives just trying to go across the deserts and mountains and high and infamous militarized walls at the US border, worst and more sophisticated than the one in Berlin, Germany, and in the most extreme weather and human conditions, and everything is because of @hunger@ and afraid of the criminal situation at home… Not because they are illiterate nor because they are lazy to work, but because the government kept them this way on purpose, and US old policy of keeping Latin America all ways in the need for help and big @economic credit@ from big brother “Uncle Sam”. The growth of the city of Monterrey, Mexico’s industrial powerhouse Mexico City’s “Today you can’t drive” (Day without a Car) program, “Hoy no circula”.